Sorsogon maybe an obscure province but its utterly charming beaches kissed by exotic marine life-rich waters should not be overlooked and skipped by idyllic tropical holiday seekers who want heartening places away from the arduous urban crowd. Blissfully leaned on the southeastern tip of Luzon, Sorsogon is an unassertive province of one city — Sorsogon City, the provincial capital -- and 14 towns. Notwithstanding, however, the coastal location of all these localities, except the landlocked town of Irosin-- that is wrapped along superb beaches-- oftentimes, the province is ignored. The province also boasts of high mountains to climb beneath verdant forests of exotic wildlife, an active volcano from where hot and cold natural springs emanate and plenty of historical sites featuring antique structures like century-old churches, watchtowers and monuments. The regional office of the Department of Tourism (DOT) based in this Bicol’s tourism center wants travel enthusiasts to grasp these as an offer of the bests of the province’s come-ons, other than the famous whale sharks of the town of Donsol. One place to go not far from the Donsol is the Panumbagan Sand Bar, a five-kilometer-long tamarind fruit-shaped islet richly endowed with fine, pearly white sand belonging to the nearby town of Pilar. The local government provided the islet with a well-engineered series of facilities like floating cottages connected with each other by floating bridges made of industrial bamboo and built in style in three octagonal rings. More developments are in the offing for this site through a Php 3.5-million fund allocation provided by the DOT via the Grassroots Participatory Budgeting Process (GPBP) of the agency under the 2015 General Appropriation Act, Maria Ong-Ravanilla, the DOT regional director for Bicol, on Tuesday said. “At this point and time, escapade in Donsol would no longer be complete without experiencing what Panumbagan Sand Bar offers -- like the taste of sea grapes (locally called “lato”) that are abundant at the surrounding Panlatuan Bay and could be harvested from under the water by visitors themselves and eaten fresh,” Ravanilla said. Panlatuan Bay, a cove covering three barangays of Pilar, is the ancient site of Astillero de Panlatuan, the once-famous shipbuilding yard established after the end of Galleon Trade in 1650. Sea grapes (Caulerpa lentillifera), an edible seaweed variety reported to have antibacterial and antifungal properties and believed to have a cure to hypertension and rheumatism, abundantly and naturally grow under the pure seawater of the bay for its high salinity. This pretty green seaweed -- which studies show to contain high amount of minerals, balanced amino acid profile and iodine -- is made up of tiny oblong, greenish crystalline balls. Edible sea urchins, locally named “suwaki” (Sea Urchin Roe) that are known as aphrodisiac in Japan for thousands of years, can also be found around the area. Panumbagan could be reached via a 50-minute motorboat ride from the Pilar port, passing along the Bantigue Point and Marine Sanctuary Reserve -- a cool place for diving and snorkeling, viewing and interacting with various colors, shapes and types of corals, fishes and other underwater characters. Both places are perfect for nature lovers who want to be embraced by peaceful ambiance, hear the music created by the sea breeze, and enjoy sun bathing, bare foot sand walking, swimming, and savoring tranquility. Ravanilla describes these places as among Sorsogon’s perfect getaways from a busy life that are now among the most visited places in the province because of its proximity to the whale shark sanctuary of Donsol. Tourists, mostly Malaysians and Russians coming for the whale sharks, have been making side trips to these areas to discover for themselves these wonderful add-on experiences, she said. Other than whale shark interaction in Donsol, Ravanilla said, the DOT has also provided GPBP fund for the putting up of a Visitor Center and Landing Area for tourists who are fascinated by firefly watching along the coastline of the town’s giant marine mammal sanctuary. Firefly watching has been the nighttime attraction that entices visitors to stay in Donsol during the night after their daytime whale shark encounters, and these facilities are designed to make their night outing convenient and comfortable, she said. Other developments in the Sorsogon tourist sites are the canopy walk and floating wellness center provided by the DOT for Bulusan Lake out of its 2014 GPBP fund worth Php2.8 million. 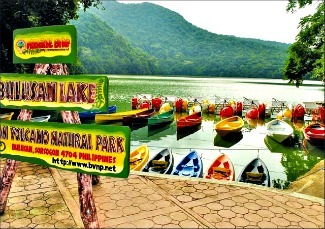 The lake sits at the bosom of Bulusan Volcano Natural Park, a 3,672-hectare protected area serving as home to various species of endangered animals and considered the most exciting ecotourism site in the province next to Donsol. The park also boasts of several springs and waterfalls that originate from the mountains. One of the springs is the bathing-favorite Masacrot, a man-made earthen pool with cool mineral waters coming from underground springs. Bulusan Lake itself, which is situated at the very foot of Mt. Bulusan -- one of the most active volcanoes in the Pacific Rim of Fire, is a spectacular ecotourism destination for its scenic and exquisite beauty. Rising 340 meters above sea level, the lake that occupies an area of more than 16 hectares is dubbed as the “Swtizerland of the Orient” for its pristine perfection and the coolness of its mountain breeze. Another tourist attraction at the Bulusan town is the Punta Diamante, the muralla (stone fort) that encloses the church complex of St. James the Greater Parish which remains grand in its antiquity together with the belfry, the largest of the four watchtowers dotting the historical complex.